Oxford University Press, USA, 9780195158939, 288pp. Critics have long treated the most important intellectual movement of modern history--the Enlightenment--as if it took shape in the absence of opposition. In this groundbreaking new study, Darrin McMahon demonstrates that, on the contrary, contemporary resistance to the Enlightenment was a major cultural force, shaping and defining the Enlightenment itself from the moment of inception, while giving rise to an entirely new ideological phenomenon-what we have come to think of as the "Right." 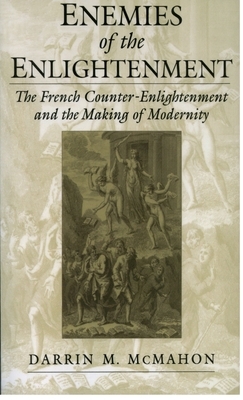 McMahon skillfully examines the Counter-Enlightenment, showing that it was an extensive, international, and thoroughly modern affair.